This book is a great read if you are a manager or a supervisor; even if it is only being in charge temporarily for a day. Author, Deborah L. Whitworth, has been a human resource manager for over 20 years. She has seen it all! She believes that management isn’t rocket science but a process, where the manager acts as a good role model. She teaches by example and tries to do everything right. Deborah believes that management is not an exact science. It is an art form. Some of us happen to be born with more talent than others. She claims that not everyone is management material and if so, you should admit it, accept it and move on. You want to do the right thing. Unfortunately, nobody has told you what the right thing is. In this book, Deborah will help you determine if you are management material, or not, or whether you need a little help. She’ll act as a role model and show you how to manage yourself, so you can be free to manager others. Deborah shares some memories from her past experiences, as human resources manager in a variety of industries. She realises that practising good management doesn’t come easy to all managers. The goal of this book is to provide you with a step-by-step method of acquiring practical management skills. Chapter 5: Just Do It! Chapter 6: How Are We Doing? Chapter 10: Did Not. . .Did Too! Chapter 11: Dotting Your "I's"
"You're Hired....You're Fired! 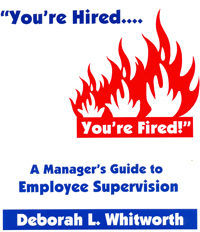 ": A Manager's Guide to Employee Supervision by: Deborah L. Whitworth, 144 pages, ISBN 978-1-55270-146-1 softcover; published in 2004; Canadian $24.95.